This pure indica strain grows dark, fat leaves that suggest both the classic “marijuana” symbol and the maple leaf symbol of Canada. This variety is a potent pure indica with an expansive sweetness that is pleasantly free of acridity, even in its largest colas. Maple Leaf’s “hero” buds develop along the main stem. When growing big plants, she can be topped to form a multi-branching plant with good results. When growing smaller or in sea of green, these plants cooperate nicely, producing little side branching which allows for good yields and minimal pruning in the space available. The internodes are close, even when plants are grown to bigger sizes. Maple Leaf Indica creates a lovely gloss of resin coating to protect its precious flowers from the elements. The glands stay slick and clear right up to harvest, rather than turning milky and opaque, which is generally an indication of a thicker cellulose capsule on the gland rather than greater cannabinoid content. 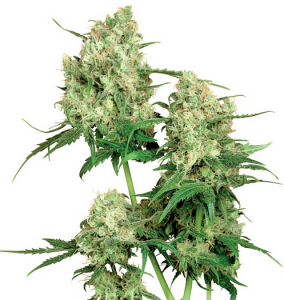 The buds usually have rounded indica tops, ending in a cluster of three or more ovaries, rather than a single “point”. Once it is properly cured and dried, Maple Leaf Indica stash retains a sweet, somewhat incense-like palate from her Afghan parentage, with no hints of the less favorable odors of the pot palate. So long as it is not overindulged to the point of sleepiness, this variety is purported to have aphrodisiac properties. It provides a warm body hum that relaxes and enhances physical sensations, helping set an inviting mood for romance, dining or the appreciation of music or a good movie. Ever smoke or grow maple leaf indica? Tell us about it in a comment below!